In 2013, I built the tiny house with my then-partner Anjali as a space designed specifically for us both to live… with our angel of a dog Anya, as well. After finishing building the house in Iowa, we then towed it over 2,000 miles to Northern California. We lived together in the house for nearly 1.5 years, during which we learned a tremendous amount about how to navigate living in a very small space, including: balancing each others’ needs for space & privacy, communication dynamics, organization & simplification, and more intensive way of respecting one another. In the spring of 2015 we parted ways. Anjali went on to pursue the next phase of her education and life. She was disappointed to leave the home we had created together, but the separation was in support of the greater good for both of us. As we have shared with many of you in the tiny house community, the decision to part ways was not based on the inherent challenges of tiny house living, but on differing passions and goals that we had both been aware of for a long while. In fact, we both feel we “rocked it,” so to speak, in the tiny house together, even living harmoniously through the separation process. I continue to live in the house full-time with the dog, and we are having a great time … and are enjoying the additional space! I have now been living alone, for the most part, for a few months and in some ways the benefits of tiny living are more clear to me now than before. Every day I now have more space to really appreciate the feeling of living in a house crafted exactly for my needs, and with a style and materials that consistently bring beauty and comfort to my life. I’m realizing more of the original intentions for the house: to spend more time outdoors, more time connecting with friends, and embracing the ease in which I can follow daily inspirations … wherever they may take me. Both Anjali and I strongly believe that relationships can thrive in tiny houses given the proper preparation, awareness, and communication. Even though we are no longer romantically involved, we are still very dear friends, and Anjali stays with me from time to time in the house. We continue to enjoy learning from the experiment of living in a way that necessitates flexibility, honesty, and integrity. The joys and challenges of tiny house relationships is one of our favorite topics to discuss. I (and maybe even Anjali) will be speaking about this at the Tiny House Jamboree in Colorado Springs in August! Though this is fairly old news, we wanted to let you all know about this change in a more formal way, and to make sure we were portraying our lives as tiny house folks as honestly as possible. 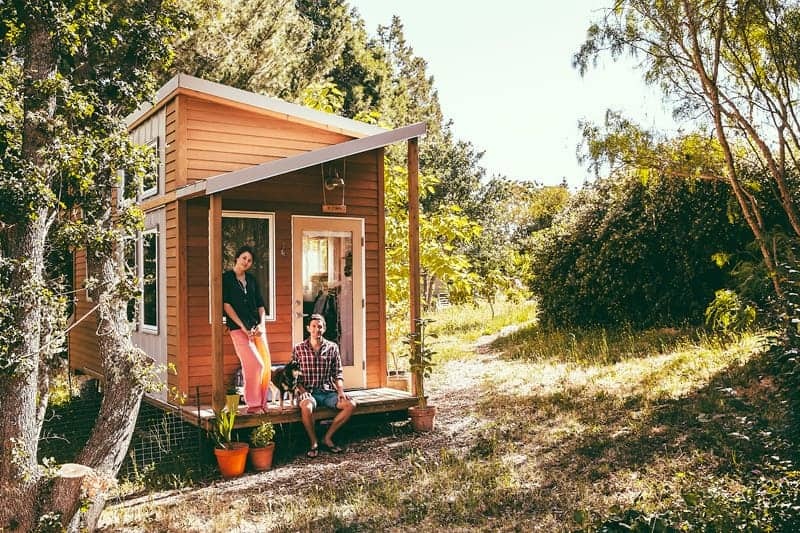 I (and Anjali) are still really excited about what this tiny house experiment will lead to and the effect it may have on not only our lives but the numerous couples and families that are choosing this lifestyle. How do you navigate relationship in a tiny space? What have you found is the most important factor for a thriving tiny house relationship? Hi Alek- Thank you for this post. I’m sad to hear the news – because I think both of you are amazing people… I totally understand and respect your decision to part ways. Living in my own Tiny House while maintaining a relationship with my partner, I empathize with you. Although my partner and I live very close on the same property, I think our relationship is successful because of the space we give each other. This may not be right for anyone else, but it works for us. Everyone can decide what is best for them. Tiny houses can allow for flexibility with life’s changes. That’s what’s so wonderful about tiny houses! Hi Rena. On the outside of the house I have a small storage box/shed that I keep tools and a few misc building materials in. oh god, no surprise there. when i saw that video with the lovely blonde interviewer (i don’t know her name) it was very clear anjali was desperate to leave. in fact, this was deeply commented by strangers on the youtube video, for better or worse. BUT i hope you are happy and that you find a person that enjoys being with you in your lovely tiny house! best of luck!